History is bunk. Admit it. That's why hardly anyone bothers reading up on the brewing histories of towns, cities and states. There are Pokemon to be caught and Twitter threads to be launched and followed. Who has time to read? Nonetheless, chump that I am, I bought a copy of Michael Rizzo's book, Washington Beer: A Heady History of Evergreen State Brewing. The book was published earlier this year by The History Press, the same outfit that published Portland Beer in 2013. For the record, I've never met Rizzo, who lives in the Seattle area. He and his wife, Michelle, host Northwest Beer Talk, a weekly podcast covering craft beer. According to the book, he's worked as an historian, lecturer, school bus driver, tour guide and network administrator. Relax. I'm not here to review the book. That's not something I do here. I made an exception when Jon Abernathy's book on Bend was published a couple of years back. I did so because I know Jon and because Bend and Portland are invariably linked. The Washington book is not like mine. 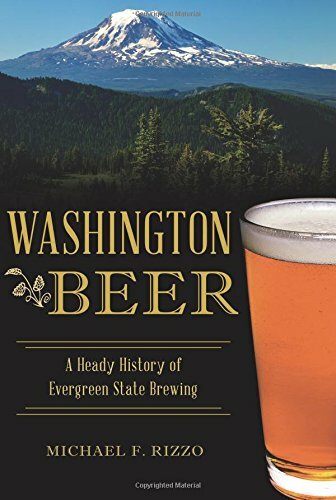 Due to the sheer number of breweries Rizzo had to cover, a book similar to mine covering the state of Washington would have consumed 300 or 400 pages. And the publisher does not want books of that length and depth. Why? Because almost no one reads crap like that. Because I was only dealing with Portland, and also because much of our history is dominated by Henry Weinhard (Blitz-Weinhard, if you prefer), I got to spend a lot of words addressing why things happened as they did. There's a lot of storytelling and historical perspective in my book. Not so in Rizzo's case. With so many breweries past and present to talk about, he focuses mostly on when, where and who founded and operated the state's breweries. There are only occasional snippets providing perspective on why things happened the way they did. I'm not a fan of this approach. I understand why it was necessary. But dates, names and places offer only a partial story. Perspective and background are needed. Limiting the scope of the book to Seattle or the Puget Sound area might have been a more reasonable approach, given the required word and page count parameters. But never mind. 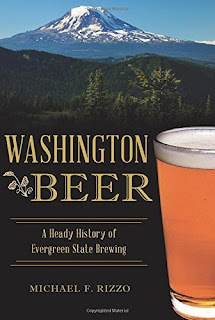 The book is what it is and it's definitely worth a read if you're interested in Washington's brewing history and don't mind wading through a lot of facts that are often, though not always, disconnected. You might not mind. What really jumps off the pages is the predatory nature of the industry. Washington's brewing history is dominated by consolidation in its various forms. Breweries and brands have been bought, sold and otherwise transferred routinely. Iconic brands like Rainier and Olympia are prime examples, but they are nothing more than examples. This isn't shocking or surprising. A primary feature of the beer industry is that it's a giant pyramid scheme. Brewers are driven to dominate markets and expand into others. Sales growth and improved cost efficiencies lead to acquisition and consolidation. It's the nature of the beast. Today, acquisitions are in the news. Anheuser-Busch and MillerCoors are buying craft breweries. Many are alarmed. But, really, what we're seeing today isn't new. It's been part of this industry for a more than a century. Washington's history illuminates and reinforces that reality nicely.